A new ECFR study highlights the role of anti-Europeans in the 2019 #European elections. In it, the authors Susi Dennison and Pawel Zerka explain how much damage critical MEPs could do in the EP and how pro-European forces can be mobilised. 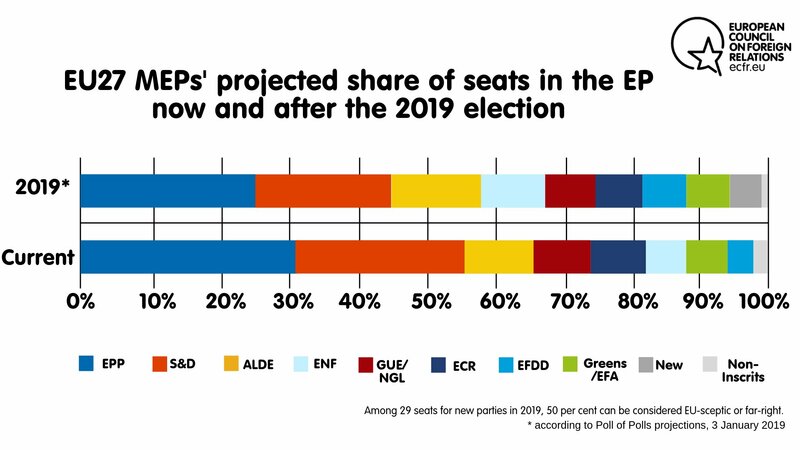 • With anti-Europeans on their way to winning more than one-third of seats in the next European Parliament, the stakes in the May 2019 election are unusually high. • While there are significant divides between them on substance, anti-European parties could align with one another tactically in support of a range of ideas: from abolishing sanctions on Russia to blocking the EU’s foreign trade agenda, to pulling the drawbridge up against migration. This would put at risk Europe’s capacity to defend its citizens from external threats at exactly the time when, given global turmoil, it needs to show more resolve, cooperation, and global leadership. • This paper marks the start of ECFR’s campaign to strengthen Europe in the face of efforts by anti-European parties to divide it and make it weaker. We analyse, in detail, the political situation in each of the EU’s 27 member states ahead of the 2019 EP election. • For supporters of an outward-looking Europe, we offer a strategy to fight back: by driving a wedge between anti-European parties, exposing the real-world costs of their key policy ideas, and identifying new issues that could inspire voters: from the rule of law and the environment to prosperity and Europe’s foreign policy goals. • In the coming months, ECFR will explore these issues at a more granular level through quantitative and qualitative surveys across the EU27. Please find the entire study here.